If you’ve ever had a really good massage, you know how wonderful it makes you feel for hours or even days afterward. And surely you’ve noticed your dog or cat loves a good tummy rub or scratch behind the ears. It’s no surprise that massage is a pet-pleaser, too, and it offers animals some of the same benefits it offers people. Medical science is making it possible for our pets to live much longer lives. But with that comes the problems associated with aging. Massage therapy helps the older, less active pet live a more comfortable life. But even young and healthy pets can benefit from a nice, relaxing massage, just as humans can on their best and least stressed days. Why should my pet get a massage? If you have a senior pet, massage can relieve age- related problems like arthritis, hip dysplasia, and the general slowing down that comes with the years. Massage also can be used to address behavioral issues or other health problems. If your pet is anxious, massage can help soothe nerves and alleviate stress. If your pet is highly active, massage can alleviate spasms, trigger points, and the tensions that build with high activity levels. If your pet has neck pain, back pain, or concerns related to bad posture, massage can help aid muscles return to their proper relaxed states, increasing comfort level and improving posture. Alpha dogs particularly benefit from massage, as they stay busy with various tasks and rarely relax fully throughout the course of a day. Massage can help an alpha pet unwind for a little while. A less common reason to have your pet massaged is to assist a grieving process. If your pet’s housemate has recently died or has moved out of the home, massage can help a pet relax and deal with grief more openly. Will my cat really tolerate a massage? You may be surprised. Cats can often be more receptive to massage than dogs. They just show their unique personalities about it. A cat may tolerate less time on the table, and they will often end a session abruptly, but they seem to enjoy massage very much, and they may be quite demanding at the next appointment. My dog is energetic and bouncy. Will he calm down enough for a massage? 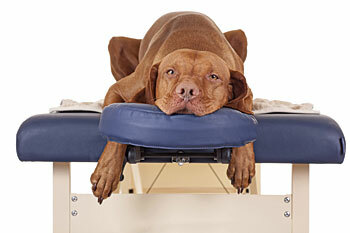 Most dogs love massage and will settle into it willingly, although some do take longer to calm than others. Your pet’s first session may be short as he learns to understand this different kind of touch, but he will most likely love it in the end. After introductions the pet is encouraged to sit or lie down, and the session begins. Work can be done on a standing animal as well. Sessions last the length of the pet’s attention span, and each session may be different from the last. Different areas can be addressed and different strokes used. Strokes used are similar to those used on humans. Your pet processes new ideas kinesthetically and he may get up and move around, taking a break during the session. This is normal, and often encouraged. It’s best to massage a pet after his daily exercise routine and when the house is quiet, relatively free of distractions and traffic. With a few exceptions, a dog relaxes best in an area away from other pets and family members. What do I do after the session? Allow your pet the chance to go out for a potty break soon after the massage. Provide lots of fresh water, both during the day and overnight. If your pet doesn’t drink much, you might try wetting his meals with water to compensate. It’s a good idea to take a short walk the evening of the massage, if your dog is willing. How will my pet feel after a massage? Pets’ families report that their animals seem very happy after a massage — more energetic and happier, or more peaceful and relaxed. More energetic animals tend to relax and those with low energy levels often feel perkier. Senior pets may act younger, and you may notice that your pet does things that he hasn’t attempted in a while. Be careful. Don’t let an older pet overdo, even if it suddenly seems to feel younger. If he wasn’t strong enough to do something before a massage, he still isn’t afterward, no matter how frisky he feels.